Nothing says party like an Ice Cream Truck stocked full of all the novelty products you remember from childhood, as well as top-notch premium ice cream bars and cones. 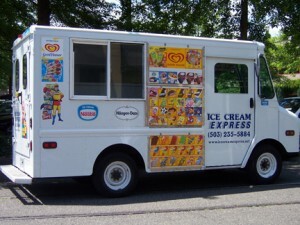 Ice Cream Express’s fleet of traditional ice cream trucks are prompt, professional, and a great deal for events around Portland and in Washington State in Olympia, Tacoma, Kent, Seattle, Bellevue, and Everett. Perfect for outdoor or indoor events, any time of year! 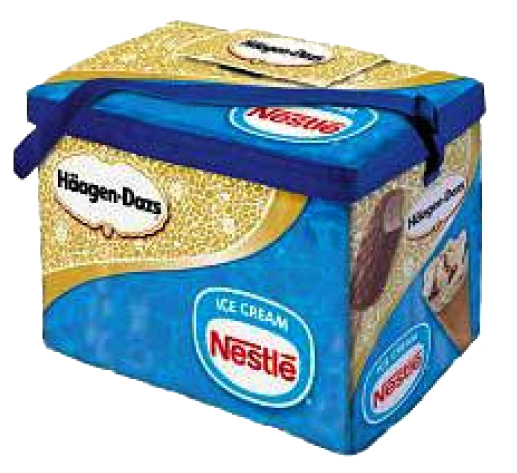 The pushcart holds up to 600 ice cream bars. 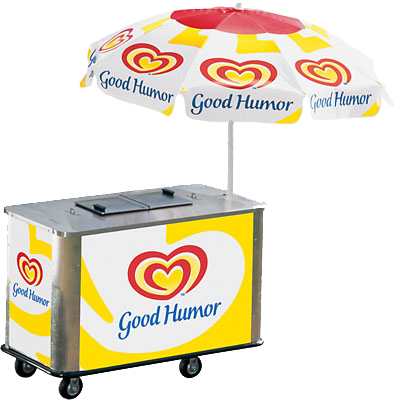 Stock it full of your favorite ice cream products and serve your guests or employees from underneath the ice cream cart umbrella. Not enough people for a whole push cart full of ice cream? Rent a Hawker Bag! Great for a quick, portable ice cream treat hand-out, the Hawker Bag holds up to 100 ice cream bars and uses dry ice for cooling. It’s easy to transport and easy to use.